The research of Jonathan Borwein has had a profound impact on optimization, functional analysis, operations research, mathematical programming, number theory, and experimental mathematics. Having authored more than a dozen books and more than 300 publications, Jonathan Borwein is one of the most productive Canadian mathematicians ever. His research spans pure, applied, and computational mathematics as well as high performance computing, and continues to have an enormous impact: MathSciNet lists more than 2500 citations by more than 1250 authors, and Borwein is one of the 250 most cited mathematicians of the period 1980-1999. He has served the Canadian Mathematics Community through his presidency (2000-02) as well as his 15 years of editing the CMS book series. Jonathan Borwein's vision and initiative have been crucial in initiating and developing several institutions that provide support for researchers with a wide range of scientific interests. A few notable examples include the Centre for Experimental and Constructive Mathematics and the IRMACS Centre at Simon Fraser University, the Dalhousie Distributed Research Institute at Dalhousie University, the Western Canada Research Grid, and the Centre for Computer Assisted Research Mathematics and its Applications, University of Newcastle. The workshops that were held over the years in Dr. Borwein's honor attracted high-caliber scientists from a wide range of mathematical fields. This present volume is an outgrowth of the workshop on `Computational and Analytical Mathematics' held in May 2011 in celebration of Dr. Borwein's 60th Birthday. The collection contains various state-of-the-art research manuscripts and surveys presenting contributions that have risen from the conference, and is an excellent opportunity to survey state-of-the-art research and discuss promising research directions and approaches. Illustrations note 9 Tables, black and white; 18 Illustrations, color; 15 Illustrations, black and white; XV, 701 p. 33 illus., 18 illus. in color. The research of Jonathan Borwein has had a profound impact on optimization, functional analysis, operations research, mathematical programming, number theory, and experimental mathematics. Having authored more than a dozen books and more than 300 publications, Dr. Borwein is one of the most productive Canadian mathematicians ever. His research spans pure, applied, and computational mathematics as well as high performance computing, and continues to have an enormous impact: MathSciNet lists more than 2500 citations by more than 1250 authors, and Borwein is one of the 250 most cited mathematicians of the period 1980-1999. He has served the Canadian Mathematics Community through his presidency (2000-2002) as well as his 15 years of editing the CMS book series. The workshops that were held over the years in Dr. Borwein's honor attracted high-caliber scientists from a wide range of mathematical fields. 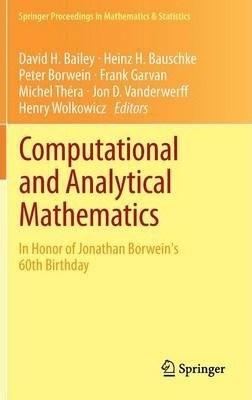 This present volume is an outgrowth of the workshop entitled 'Computational and Analytical Mathematics, ' held in May 2011 in celebration of Jonathan Borwein's 60th Birthday. The collection contains various state-of-the-art research manuscripts and surveys presenting contributions that have risen from the conference, and is an excellent opportunity to survey state-of-the-art research and discuss promising research directions and approaches. 1. Normal Numbers and Pseudorandom Generators (D.H. Bailey and J.M. Borwein).- 2. New Demiclosedness Principles for (Firmly) Nonexpansive Operators (H.H. Bauschke).- 3. Champernowne's Number, Strong Normality, and the X Chromosome (A. Belshaw and P. Borwein).- 4. Optimality Conditions for Semivectorial Bilevel Convex Optimal Control Problems (H. Bonnel and J. Morgan).- 5. Monotone Operators Without Enlargements (J.M. Borwein, R.S. Burachik, and L. Yao).- 6. A Brondsted-Rockafellar Theorem for Diagonal Subdifferential Operators (R.I. Bot and E.R. Csetnek).- 7. A q-Analog of Euler's Reduction Formula for the Double Zeta Function (D.M. Bradley and X. Zhou).- 8. Fast Computation of Bernoulli, Tangent, and Secant Numbers (R.P. Brent and D. Harvey).- 9. Monotone Operator Methods for Nash Equilibria in Non-Potential Games (L.M. Briceno-Arias and P.L. Combettes).- 10. Compactness, Optimality, and Risk (B. Cascales, J. Orihuela, M. Ruiz Galan).- 11. Logarithmic and Complex Constant Term Identities (T. Chappell, A. Lascoux, S.O. Warnaar, and W. Zudilin).- 12. Preprocessing and Regularization for Degenerate Semidefinite Programs (Y.-L. Cheung, S. Schurr, and H. Wolkowicz).- 13. The Largest Roots of the Mandelbrot Polynomials (R.M. Corless and P.W. Lawrence).- 14. On the Fractal Distribution of Brain Synapses (R. Crandall).- 15. Visible Points in Convex Sets and Best Approximation (F. Deutsch, H. Hundal, and L. Zikatanov).- 16. On Derivative Criteria for Metric Regularity (A. Dontchev and H. Frankowska).- 17. Five Classes of Monotone Linear Relations and Operators (M.R. Edwards).- 18. Upper Semicontinuity of Duality and Preduality Mappings (J.R. Giles).- 19. Convexity and Variational Analysis (A.D. Ioffe).- 20. Generic Existence of Solutions and Generic Well-Posedness of Optimization Problems (P.S. Kenderov and J.P. Revalski).- 21. Legendre Functions Whose Gradients Map Convex Sets to Convex Sets (A. Knecht and J. Vanderwerff).- 22. On the Convergence of Iteration Proceses for Semigroups of Nonlinear Mappings in Banach Spaces (W.M. Kozlowski and B. Sims).- 23. Techniques and Open Questions in Computational Convex Analysis (Y. Lucet).- 24. Existence and Approximation of Fixed Points of Right Bregman Nonexpansive Operators (V. Martin-Marquez, S. Reich, and S. Sabach).- 25. Primal Lower Nice Functions and Their Moreau Envelopes (M. Mazade and L. Thibault).- 26. Bundle Method for Non-Convex Minimization with Inexact Subgradients and Function Values (D. Noll).- 27. Convergence of Linesearch and Trust-Region Methods Using the Kurdyka-Lojasiewicz Inequality (D. Noll and A. Rondepierre).- 28. Strong Duality in Conic Linear Programming: Facial Reduction and Extended Duals (G. Pataki).- 29. Towards a New Era in Subdifferential Analysis? (J.-P. Penot).- 30. Modular Equations and Lattice Sums (M. Rogers and B. Yuttanan).- 31. An Epigraph-Based Approach to Sensitivity Analysis in Set-Valued Optimization (D.E. Ward and S.E. Wright).